Wowsers this summer is flying by! Between work, travel and projects I have been a very busy girl! I feel very blessed that I got to travel to Alaska again, an epic two week visit with family! That was amazing! If you ever get the chance to go to Alaska, I can’t recommend it enough. The beauty everywhere takes your breath away! And during the summer it is light most of the time which makes for a very interesting sleeping pattern! Next up was Salt Lake City for the Stampin’ Up Convention! Before all of that, Arizona to help my son and his girlfriend move home from college! Sheesh! I’ve been logging some miles! In between I have been super busy at work at AAA and we also had a little fire nearby (Colorado Black Forest Fire) in June and I moved my stamp room from the basement to the second floor! It’s making me tired just reading all of this! I received some very exciting news while I was in Alaska, I got a call from Stampin’ Up and was notified that I had been selected as one of the Top 20 Finalists for the 2013 Artisan Design Team! What an honor! I spent the next three weeks until Awards Night at convention with my stomach in a knot worrying about whether or not I made the team (top 10). In the end I didn’t but I still feel like I was a big winner just making the top 20! I made 19 new awesome friends too! All of the finalists connected on Facebook before convention and shared our fears and amazement at being selected! It was a crazy ride all the way around! Don’t miss our Finalist’s Blog Hop starting on Saturday, August 10th. We are featuring all the projects we submitted to Stampin’ Up for the contest. I promise amazing inspiration and beautiful work! Convention was the absolute best! I just love hanging out with my besties from near and far and catching up. We had a wonderful time laughing, crying, shopping, talking and just being together. I will share some pics and some gorge swaps from convention over the coming weeks. Today I want to share a couple of projects that I made for a friend’s wedding. We set up a joint pinboard on Pinterest and several of us pinned numerous ideas for decorations, favors, etc. One thing I knew I wanted to make for her was a card “box” out of a vintage suitcase similar to one that I saw on Pinterest. 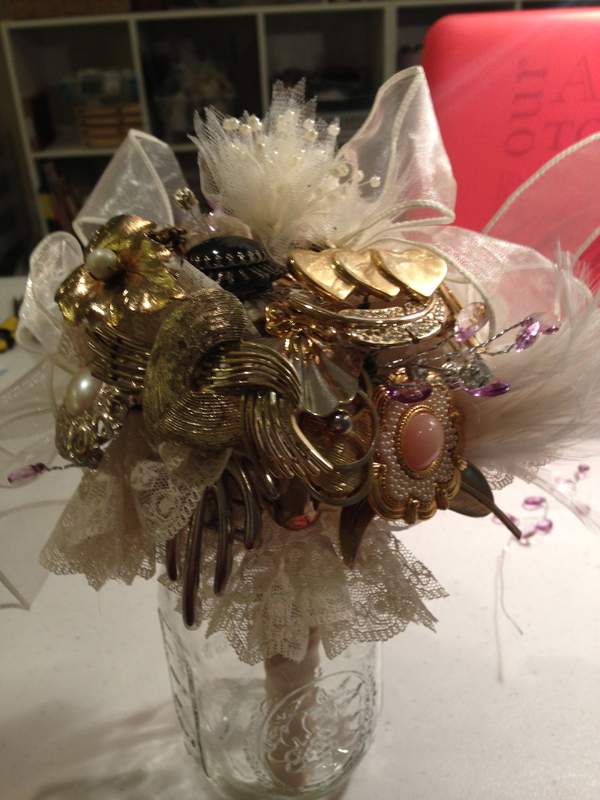 She also wanted a “brooch bouquet”. If you haven’t seen those, just Google brooch bouquet, they are so pretty! She got a couple of brooches from her grandmother and then bought the rest from the Goodwill. I found a small vintage “suitcase” in Arizona at an antique shop for $6! 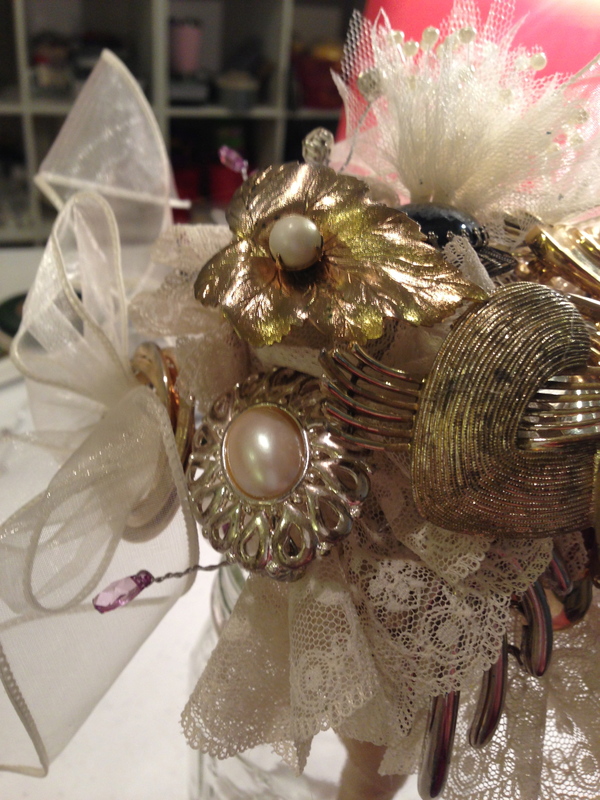 Close up of some of the brooches, her grandmother’s are clustered together. The bride with her gorgeous bouquet! Stunning! the bride and her bouquet! Nearly finished card box. This is the only picture I have of this project right now! I added a piece of retired “First Edition” DSP to the inside of the lid after I took this picture and that completed the project 🙂 I am going to get some more pictures of this beauty and will share another day. It was about 4 am when I took this and I just had to go to bed!!! Look at my giant crafting mess all around the finished suitcase. I was a busy, busy girl that night! The banner says “CARDS” and is made with burlap banner pieces. I used the Big Shot to cut out the letters in Brushed Gold paper. 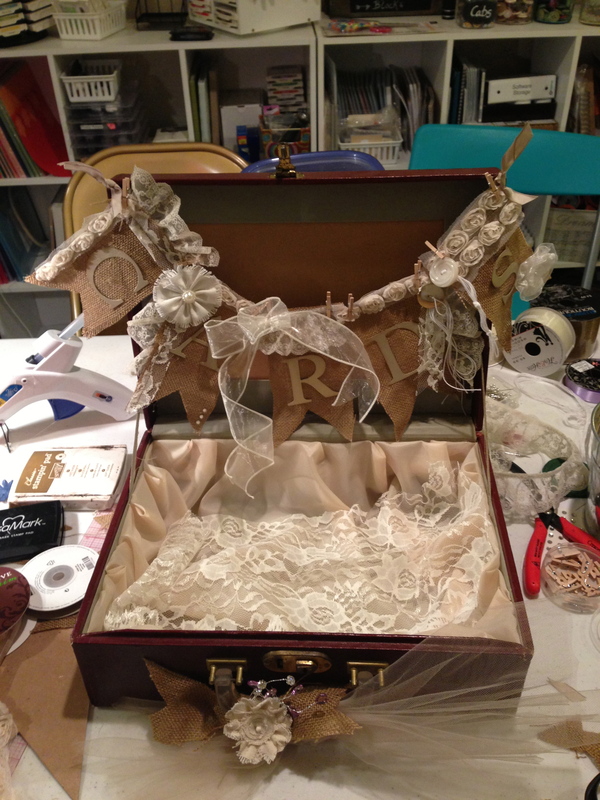 Each banner piece is embellished a little bit differently with antique lace, flower trim, buttons and ribbon. I lined the inside of the suitcase with satin fabric that is a vintage-y cream color. I added some tulle and burlap to the handle to finish the look. My bestie Debbie Keane and I are both trying to be more consistent bloggers so we are challenging each other to blog regularly. Check out her blog at http://www.pungostamper.blogspot.com. She has some amazing projects for you to drool over! We are hoping that if we keep each other accountable we will do a better job posting! Do something you love to do today! To purchase some of these products go to my online store! 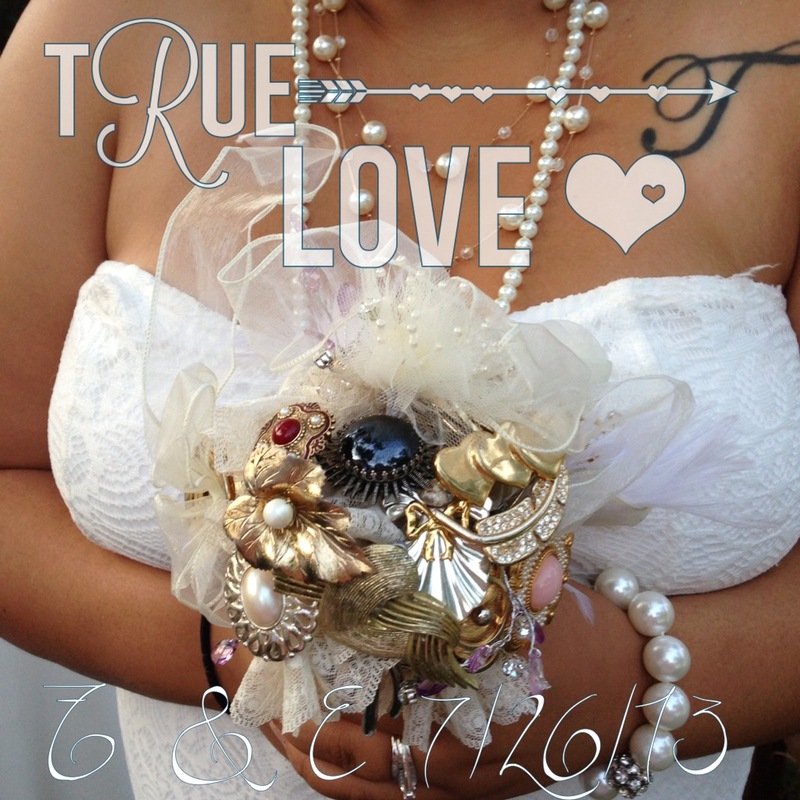 This entry was posted in 3-D, Big Shot, Brooch Bouquet, Stampin' Up, Vintage, Wedding Decor by kate80132. Bookmark the permalink.